If you've ever read the aforementioned book by Sophie Kinsella and laughed hysterically because you could "see" a little of yourself in the main character, you will *get* this post. If you totally relate to this post and have never read the book, you should read it. I guarantee you will laugh out loud. If you fall into neither of these categories, please bear with me. We all have our quirks and tolerance is a great attribute to possess. As we walked into Old Navy, a huge, glaring sign greeted us: Baby Sale - 25% Off! Oh, what was it Aaron said to do in these situations? Was it "Get in there and take advantage of that sale?" Or maybe it was "turn the opposite direction and run as fast as you can?" Knowing how much he likes to save money and knowing that walking away from a sale is like leaving money on the table, I rationalize that surely he wanted me to check it out. Once inside, I quickly found the gauchos I was looking for, but alas, Grace didn't have a THING to wear with them. Lucky for me, there was a SALE going on. I quickly found TWO tops to go with (a girl can't wear the same outfit all the time!) Then there was reason #2 for our trip, the jacket. I found a darling denim one and they had the cutest little jeans to match. How could I pass them up? On the way out, I noticed they had socks on sale 10 pair for $10. Babies can never have enough socks, right? hint: Grace now does! As the cashier completed our transaction, she handed me a coupon. Now, I've gotten these many times and they are always for some date in the future for which I forget that I have the coupon. But this time the coupon was good TODAY. And it was for 15% off of your purchase at any Gap Store. You guessed it, Baby Gap included! Now, even as a self-proclaimed shopaholic, I seldom ever buy Grace anything at Baby Gap because even I can't justify it, but you know the whole sale and money left on the table philosophy, so off we go! As I entered Baby Gap, I started to worry that my Scarlet Letter ("S" for shopaholic of course) was showing as salesperson after salesperson bounded over to tell me about the great sales that were going on. Mind you, I had the 15% off coupon in my pocket to make these great sales even better. There were a few items that I couldn't resist and all in all, I really did get a great deal on my purchases. So now Miss Grace is set. She has gauchos to match mommy's AND a new jacket (or 2!) :) And I, well I'm still feeling good about the deals, but do recognize that I probably went a little overboard. But hey, little girls are fun to buy for....ESPECIALLY for shopaholics! 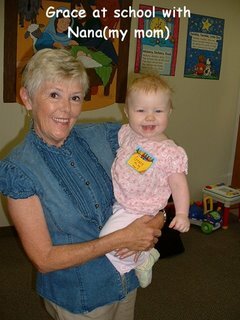 We decided to enroll her in the Mother's Morning Out program at the preschool where my mom teaches. It is a two day a week (three hours each day) class. She's only 10 months old and my plan is to go with her for the first couple of months until she really gets used to it (hence the "sort of" in the title of the post). Today was orientation, also known as "THE FIRST DAY OF SCHOOL." Today Grace and I had the opportunity to see what we are getting ourselves into. Understand, on a typical day, Grace and I go...well nowhere other than taking Tyler to school. It figures that on the day we had somewhere to be in the morning, she decided to sleep in and when she DID wake up, her hair was an uncontrollable mess. No time to sweat the small stuff, we dashed out the door and on our way to our big day! Grace was all smiles as we walked into the building and I was doing great until I was handed a "Parent's Survival Kit." "How cute!" I thought as I looked inside. "What's that?...Kleenex?...Oh No!" Never ever tell a pregnant woman she is SUPPOSED to cry! *choke* Quickly I reminded myself that I'm staying with her. When I regained my composure, it was time for me to leave the room for parent's orientation. After watching two other parents make a big deal over leaving the room and observing the meltdown that followed from their children, I decided not to make a scene and to quietly leave (sneak out of) the room. During the 30-minute orientation, Grace was a good little girl. Because the room I was in was right across the hall from her, I could hear her start to cry at near the end of the meeting. When I got back into the room I realized that she had needed a diaper change and her teacher was changing it when I returned. I quietly gave Grace a "High 5" when the teacher wasn't looking for letting someone else take care of one. My pregnant spidey sense of smell has made changing diapers much harder for me to bear than normal and I am more than happy to share that duty with whomever will help! Let's face it, 9-months is a long time to wait for an event as momentous as the arrival of a new baby. In today's "I want information and I want it NOW" world, the wait to find out the gender of the baby (whether it be 20-weeks for a gender ultrasound or the whole 40-weeks for the birthday surprise) MUST be filled with some kind of speculation to help pass the time. 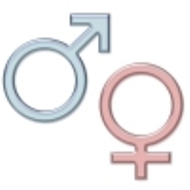 So far, I have played the gender guessing game with both of my children. And so far, I have been 100% wrong, but I'm not about to stop guessing now!! Now, for those who haven't a clue what they might be carrying, there are many different "resources" available to help formulate a guess. First of all, there are the "mature" ladies in the grocery store. Solicited or not, these wise ladies are likely to give you an opinion based on things like the width of your nose, how you're carrying the baby, the size of your rear-end, etc. Be prepared though, if you choose this route, to be poked, prodded, and have your shirt lifted so a good view of your backside can be obtained. Also be prepared for questions about intimate things including the kind of underwear your husband wears. While these things may seem intrusive, they are all important pieces of the puzzle used to figure out the gender mystery. Based on my experience, roughly half of these ladies are able to correctly predict the baby's gender. Should the "in person" resources seem too daunting, never fear! It is possible to NEVER leave your home and obtain reliable information about whether you are carrying a lad or lass right over the internet! Everyone who has ever been pregnant had heard of the chinese lunar calendar method of gender prediction. It plugs the mother's age at conception (in lunar years) and the month of conception into a formula and tells you what you are having. Plain and simple. So far, I have had two children and the chinese lunar calendar has a 50% success rate with them. Another lesser-known source is babyman.net. This guy collects similar information, but has a different formula because the answers are not always the same. This method predicted my first two children would be girls. I have one boy, one girl, so....wow, look at that...50% correct. And let's not forget the gender mentor test. This is the one where you send them a blood sample and they email you the gender. I'm not sure what the accuracy rate of this one is, but I have known people for whom it has been wrong. At $275 a pop, I think I'll pass on this one. Besides, if I knew the gender this early, what would I do for the rest of the pregnancy? The bottom line is, ALL of these methods are what are known in the marketing research world as "SWAGS" (sophisticated, wild %&$ guesses). Anybody can make a guess and have a pretty darn good chance of being right (well at least as good as the chance of being wrong). Though my "gut" method of predicting has yet to be right, it is based on a much smaller sample size than many of the other "sources" out there. Aaron got a new job! With the threat if impending layoffs in the air, he just happened to fall into an opportunity that we think is perfect for him! He has been working as an engineer for about five and a half years and he was doing an hour and a half (each way) commute two to three times a week. The prospects for advancement were also looking bleak so he had actually started looking for job opportunities outside of his company. We were both praying frequently about what he should do, where we should live, etc. Because of our situation with Tyler, I could never get comfortable with moving out of the area, but the chances of something turning up locally seemed to be slim to none. Then out of the blue, his manager mentioned a new program they are implementing that he thought Aaron would be a good candidate for. It was a technical sales support position that included a work from home arrangement. In a whirlwind 3 days or so, Aaron applied, interviewed, was offered the position and accepted. We are excited about the potential! Now we have quickly realized that with all of our bedrooms full, no extra "living" rooms, both of us working from home, and a new baby on the way, we are officially out of space. So the preparations have begun to put our house on the market. We got lots of "fixer ups" to do, so we're hoping to leisurely take care of those and put it on the market in early 2007. Let the fun begin!